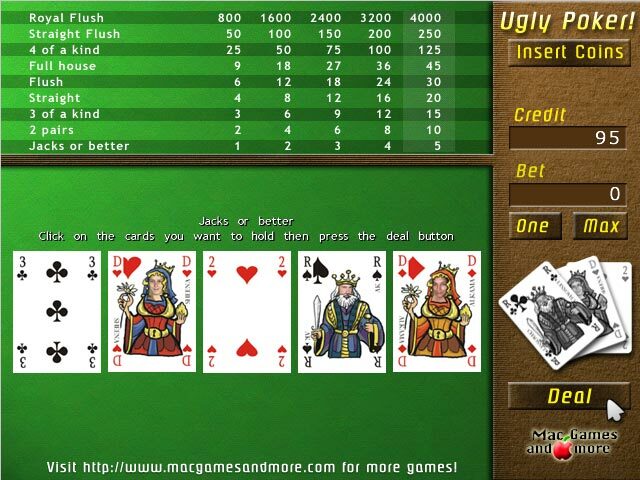 UglyPoker is a free video poker game for Mac, and will remind you a little bit of Las Vegas. Using your skill and chance, you may win the Uglypoker Royal Flush! That means you'll win 4000 UglyPoker dollars. (not real money, sorry) UglyPoker comes with detailed instructions, so you'll have all the info you need to enjoy video poker especially if you're a new player to video poker. It will become second nature once you get into the game! Qweas is providing links to Ugly Poker 1.0 as a courtesy, and makes no representations regarding Ugly Poker or any other applications or any information related thereto. Any questions, complaints or claims regarding this application Ugly Poker 1.0 must be directed to the appropriate software vendor. You may click the publisher link of Ugly Poker on the top of this page to get more details about the vendor.